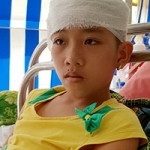 Thuy Duong fell and injured her head. 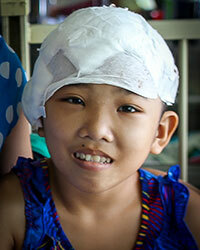 After her first surgery she recovered well and the doctors were optimistic. On December 17, 2018 she had a second surgery, which was successful. 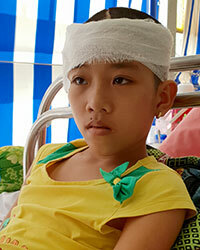 Thuy Dong is being actively monitored and treated. We are doing everything we can to help and support her and her family. DISCLAIMER: We provide this information to give our sponsors and supporters a general idea of the challenges our children face. For prospective adoptive parents, this information is not intended to be a substitute for a complete and up-to-date referral packet from your adoption agency. Please keep in mind that in our communications, we always try to focus on a child's strengths, accomplishments, and positive developments, not in an attempt to gloss-over their often serious medical conditions, but in an effort to share a glimpse of their precious personalities.